As we have revealed in full detail, Adam and Eve separated themselves from God and could not achieve perfection. Therefore God could not bless them in a heavenly marriage and human history started with a satanic instead of a Godly lineage. It is truly astonishing to realize that, even with so many billions of people having lived on earth, God has never truly had His own family. Not a single family was ever formed with the full and complete blessing of God. We are all descendants of the fallen Adam and Eve. If Adam and Eve would have united with God, they would have established the marriage of the Lamb mention in the Bible. God Himself would also have been married that same day, with the same joy, the same fulfillment, accomplishing in this way the whole purpose of creation. It is truly heartwarming to realize that, throughout the thousands of years of history, God's total goal has been the restoration of mankind into His own family. He has been longing for the day that the first heavenly wedding ceremony could take place, a divine marriage between a perfect man and woman. God wanted to see this heavenly marriage during the time of Jesus Christ. Jesus came as the Messiah, God's only begotten Son, the first man on earth without sin. He came to earth as the second Adam (1 Cor. 15:45). He was supposed to be the first perfect bridegroom on earth. As the culmination of his ministry, Jesus Christ should have restored a heavenly bride, fulfilling the prophecy of the "marriage of the Lamb." Together with his Bride, Jesus should have been installed as the True Parents of mankind, establishing the first family of God on earth. The faithlessness of the people of that time, however, did not allow this glorious day to come in Jesus Christ's time. On the contrary, he was rejected and crucified. Ever since that time, humanity was destined to receive another Adam who would establish the position of "True Parents", in the place of the first fallen parents. Unificationists believe that at this time Rev. Sun Myung Moon has successfully completed the messianic mission that Jesus Christ entrusted to him in his youth. In spite of indescribable tribulations, persecution and opposition, he was finally victorious, not only in deciphering the hidden secret of the root of the original sin, but also in finding a true solution to overcome and remove it. In 1960, after fulfilling all the required conditions and following God's command, Sun Myung Moon and his wife Hak Ja Han received this heavenly blessing to recreate the pure and sinless marriage that was lost since the time of the fall. They were subsequently further blessed by God with fourteen children. This marriage is considered by Unificationists as the foundation and starting point for God's future blessings to all mankind. That is why, since 1960, Rev. and Mrs. Moon blessed in holy matrimony successively larger numbers of couples at weddings within the Unification Movement. In 1960, 36 couples, and in later years 72, 124, 430, 777, 1,800, 8,000 couples and others. The latest one of these memorable ceremonies was held on 25th August 1992, in Seoul, Korea for 30,000 couples, symbolizing a God-centered unity, not just of men and women of all races, but also of numerous different nationalities, coming from all over the world to freely, joyfully and gratefully accept this greatest blessing of all time from our Heavenly Father. This was truly an historical occasion ! 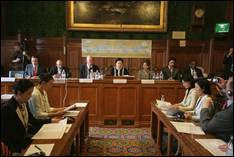 The previous day to this large wedding ceremony, on August 24, 1992, before a large international audience of religious and political leaders, scientists, academics and journalists, gathered in Seoul, Korea, Sun Myung Moon announce that he and his wife Hak Ja Han had been chosen by God to be the True Parents and had successfully accomplished their mission. Through the victory of True Parents, this extraordinary marriage blessing is offered to couples from every race, religion and nation on earth, bringing them new meaning and a new standard of family life, and realizing a purification of lineage that offers future generations the real prospect of a completely different and good world. In the future, as people come to understand the value and quality of these precious families, millions will seek such marriages. Through them, God can restore the family that Satan has destroyed. Such restored, God-centered families are the very building blocks of an ideal nation and world. Rev. and Mrs. Moon announced on January 3, 1993, the beginning of the "Completed Testament Age" and they initiated a worldwide speaking tour addressing the topic "True Parents and the Completed Testament Age." The full text of this historical declaration is included in the "Appendix A" at the end of this book. It is lamentable, that due to the initial rejection by certain Christian leaders of Rev. Moon, an enormous barrier was established that blocked the rapid spread of his important revelation on the fertile ground prepared by Christianity over the last 2,000 years. It is paradoxical and lamentable that because of this, the most prepared people, pastors, priests, monks and nuns, who should have been the first to receive this great divine blessing, were often the first to oppose these revelations and to think them scandalous. The Jesuit sociologist Joseph Fichter, who carefully studied the life style and particularly marriage within the Unification Movement, says that Unificationists "have found a family program that works. While marriage counselors and priests in parishes put their hands to their head not knowing what to do about the breakdown of family life, the Unification Church is doing something about it. The family centered on God is not merely a nice slogan or a spiritual ideal suggested by the leaders of the Church. It is the fundamental essence of the communion between the faithful of the Church." 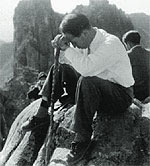 "One has to recognize their systematic program for the restoration of the "old fashioned" morality, their emphasis on chastity before marriage, prayers in preparation for marriage, readiness to accept guidance in the selection of the couple, marital love as a reflection of the love of God, and the transmission of spiritual perfection to their children. There have been many comments and much criticism of the theological, political and economic aspects of the Unification Movement, but very little has been said about the positive and valuable implications in regard to marriage and family." Due to this initial rejection of many Christian leaders, Rev. Sun Myung Moon, very heartbroken because of this situation, had to begin practically from zero and was obliged, contrary to his wishes, to create his own religious organization. "Rev. Moon organized the Unification Church in Korea in 1954. From the beginning, he told us that we are not a denominational movement, the Church is not our goal, nor the axis in order to create the Kingdom of Heaven. It is merely the instrument to teach the Divine Principle, elevate the members spiritually and carry on the work of God. When we reach our goal, the Church will be dissolved". "What is our purpose? To become true men and women. We will create the true husband and wife and become true parents to give birth to children who experience love among themselves and form a loving brotherhood. And those children and parents together will create one heavenly family. The family will expand into a true society. That true society will expand into a true nation. That true nation will expand into a true world." Rev. Moon has founded literally hundreds of organizations in the academic, scientific, economic and political fields, in the area of mass media, humanitarian projects, etc., with the purpose of bringing this world closer to God and to create a base of genuine trust, credibility and recognition so that these revelations could at last be understood and accepted by humanity. But finally the central and fundamental mission of Rev. Moon is to give this original blessing from God to create true couples and true families. Rev. 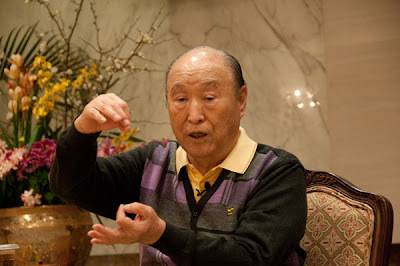 Sun Myung Moon has now the permission and authority from God to transmit this "blessing" which allows us to eliminate original sin completely, to separate from the fallen lineage and to be engrafted in the lineage of God. "The establishment of happy, righteous families as the source of life, love and joy, has been the goal of God and man throughout history. To realize this ideal, each one of you has dedicated months and years of preparation, often under very difficult circumstances. We can all be justly proud to meet here together on this day, to add another great building block to the Kingdom of Heaven on Earth. The eternal union between husband and wife. Your marriage is not merely "until death do us part," but for all time eternal. Each spouse is a great key to ever expand and deepen our understanding of the infinite God. In your marriage, God's love is consummated and together you are able to receive His total love. The tradition of family love. After seeking ideal marriages, it is your responsibility to educate your children with a commitment to moral excellence. Before you can freely invest your love and energy in other dimensions, you must by all means fulfil your responsibilities as a loving parent. Heaven is a world of heart, where all may trust and unite with one another in love. But there will be no true heaven for anyone while people are still in want, in need or in pain - physically or spiritually. You must all accept your responsibility to work as world citizens so that the legacy you leave to your children and grandchildren will be the harmonized world of God's love. "God bless you in all that you undertake and may He give you the vision and strength you need to realize His Kingdom on earth. That is the task facing us all." Hallelujah!, For the Lord our God the Almighty reigns. Let us rejoice and exult and give him the glory, for the marriage of the Lamb has come, and his Bride has made herself ready... Blessed are those who are invited to the marriage supper of the Lamb...(Rev. 19:6-9). Love is the supreme value. Love and the purpose of life. The tragic results of the wrong use of love. WHEN, HOW AND WHY DID EVIL, SUFFERING AND THE HUMAN TRAGEDY BEGIN? The search for our first ancestors. The meaning of the symbols. The first crime or original sin. THE MOTIVATIONS AND THE PROCESS OF THE HUMAN FALL. The archangel Lucifer and his betrayal. the physical and the spiritual realms. IMMATURE AND ILLICIT LOVE BECAME THE ORIGIN OF ALL HUMAN TRAGEDY AND SUFFERING. The absolute and sacred power of love. Why God did not intervene. THE HISTORICAL CONSEQUENCES OF THE FALL. The fight between the mind and the body. Our original nature and our fallen nature. Possible criticism to this vision. Circumcision, celibacy and the sacrament of marriage. The original sin affects our lineage. MOTIVATIONS OF THE HUMAN FALL.